Let's go "Around the Web" and check out all the excitement over the next film installment in Suzanne Collins's The Hunger Games trilogy, Catching Fire! First and foremost, watch the epic and awe-inspiring trailer below (which if you are a fan, you have probably already watched dozens of times since it first went online in July). Hollywood has thankfully stayed fairly true to the story and the world Collins's constructed, successfully translating and transforming the books to the silver screen, without losing any of the intensity or action of the written word. It also doesn't hurt that the films have a stellar and eclectic cast that really bring the material to life. Another reason to be excited about Catching Fire is the not-so-scientific statement of the second film in any great film trilogy usually being the best installment. The Empire Strikes Back, The Dark Knight, Lord of the Rings: The Two Towers, and The Godfather: Part II being just a few examples. I'd wager that Catching Fire will soon be next in that list. Speaking of all of those other movies, Wired has gone as far as to call Catching Fire, "The Dark Knight of Young Adult Films". 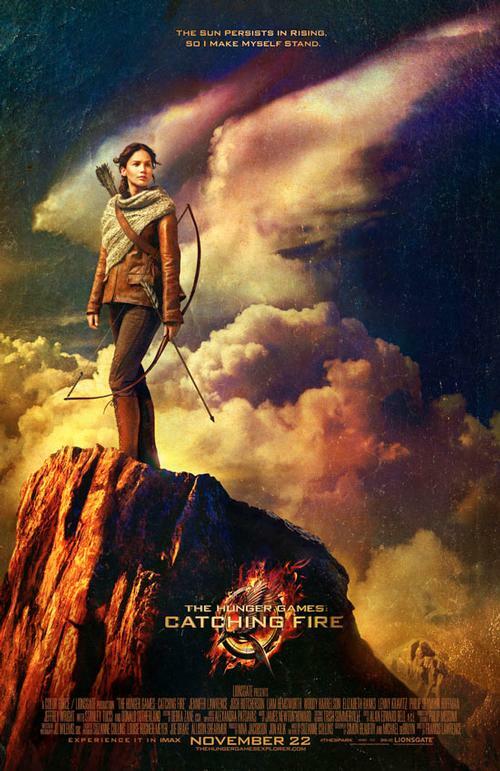 Rotten Tomatoes aggregates all the latest Catching Fire reviews from critics and fans. Whether you believe the reviews and hype or not, The Wall Street Journal predicts that Catching Fire may have the largest 2-D box office opening weekend of all time. The Today show weighs in with six reasons why Catching Fire is better than the original Hunger Games film. Hunger Games' star Jennifer Lawrence's appearance on Late Show with David Letterman earlier this week was surely a pop culture moment for the ages. Slate attempts to explain the meanings of all the characters' names in the Hunger Games universe. Billboard creates Spotify playlists for our heroes and villains in Catching Fire. Entertainment Weekly has a Catching Fire quiz sure to light a fire under even the biggest of fans. Finally, no matter if you have just started reading the books, are re-reading the books, or have only seen the movies: The Hunger Games Wikia page is the be all and end all of Hunger Games info and trivia. "Ladies and gentlemen, let the 75th Hunger Games BEGIN!" Thanks for this great compilation! So psyched to see the movie. and, Cookieness Evertreat is toooooo funny! Thank for share information. Im really wactch the great movie some day early.